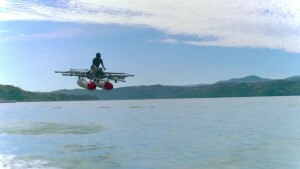 Google founder Larry Page financially backs a “flying car” company by the name of Kitty Hawk. Up until recently, we didn’t know much about the company or the capabilities of its aircraft. Now, however, Kitty Hawk has released the first official footage of its prototype all-electric aircraft, which apparently will not require a pilot’s license to fly. According to the company, people can learn to fly the thing in minutes and it is designed to operate over water so anyone who can afford it can try their luck and take to the skies. At the moment, the plan is to release a consumer version by the end of 2017. Kitty Hawk’s flying car doesn’t require a pilot’s license because it cleverly fits the classification of an Ultralight aircraft per FAA regulations. Sounds unsafe and awesome at the same time.